Spring is coming!!!! I don't know what it is about this winter, but I have never been more ready for spring before. I can't wait for warmer temperatures, the smell of rain and flowers, and some warm sun on my face. 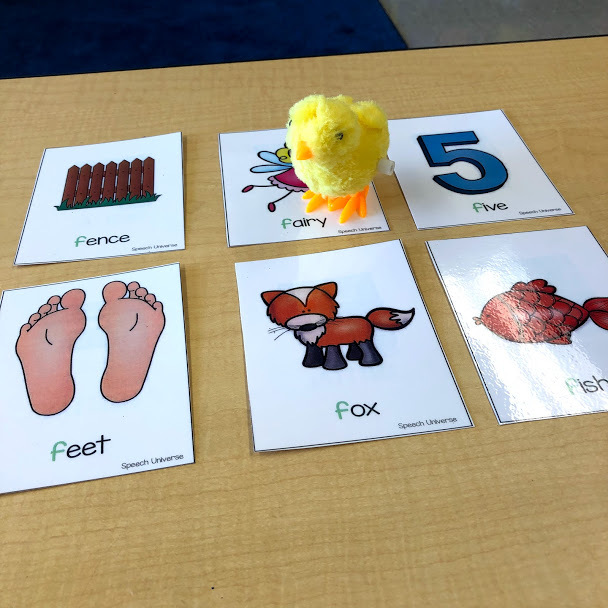 I also can't wait to use all of the cute ideas I have been starting to collect with my preschool articulation/phonological students! I found these bunny ball poppers at The Dollar Tree. What a great find! 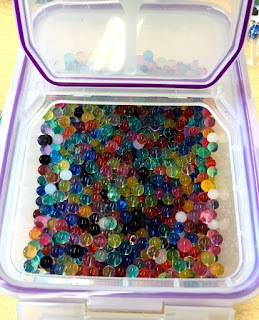 $1 for ball poppers! Definitely going to keep this in mind throughout the year. Hopefully they will continue to put out more of these for my collection. My students LOVE to pop this little guy! I have my students say their word multiple times or in a sentence before they get to pop the popper. Then they have fun taking target practice! Another Dollar Tree find was this cute chick wind-up toy. My preschoolers have really been getting into my wind-up toys, so I thought I would try this one out with a simple activity. I laid out my articulation cards and wound up the chick. Whichever cards she touched I had the students say. 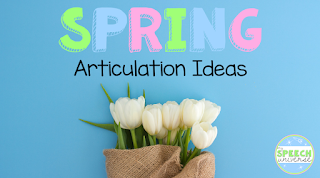 Glue and Say Spring Articulation! 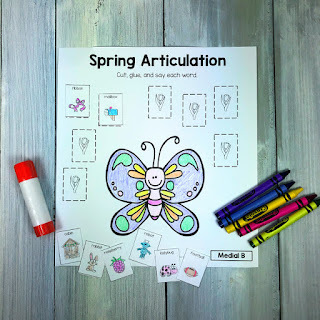 Glue and Say Articulation: Spring is a new activity that I created to go along with my Glue and Say series. I have every sound you need to target in this packet in all positions of words. Students cut out the pictures (I do this for my preschoolers to save tons of time) and then glue them into the boxes provided. 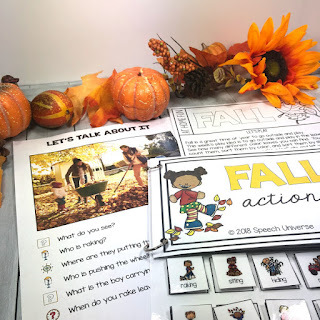 Head over to my TpT store to grab this no-prep activity. Here is a spring bulletin board that I made that used articulation words placed on flowers. My students made a whole garden! Have fun getting ready for spring in your room! I know I can't wait! 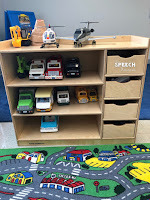 I have been working exclusively with preschool students for a little over five months now. 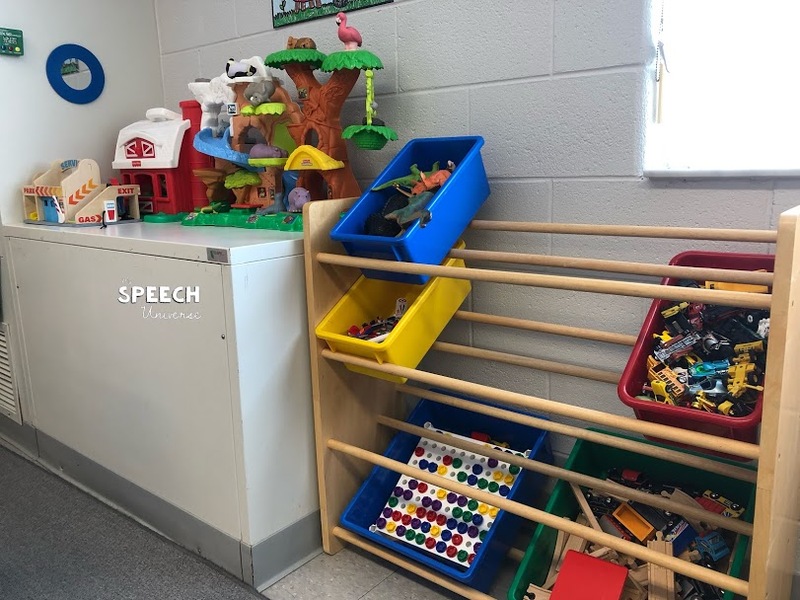 I currently have a caseload of 57 preschool students age 3-5 with a variety of speech and language disorders. The students are brought in to me by their parents at an Early Childhood Center. I see a few students individually, but the majority are seen in small groups of 2-4 (I only have one group of 4 right now). I am lucky enough to have a wonderful paraprofessional helping out in my room too! With that many students and smallish groups, you can imagine that my scheduling is pretty tight. You would be right! About 50% of my students are seen in hour long groups, and the other 50% are seen in half hour chunks. 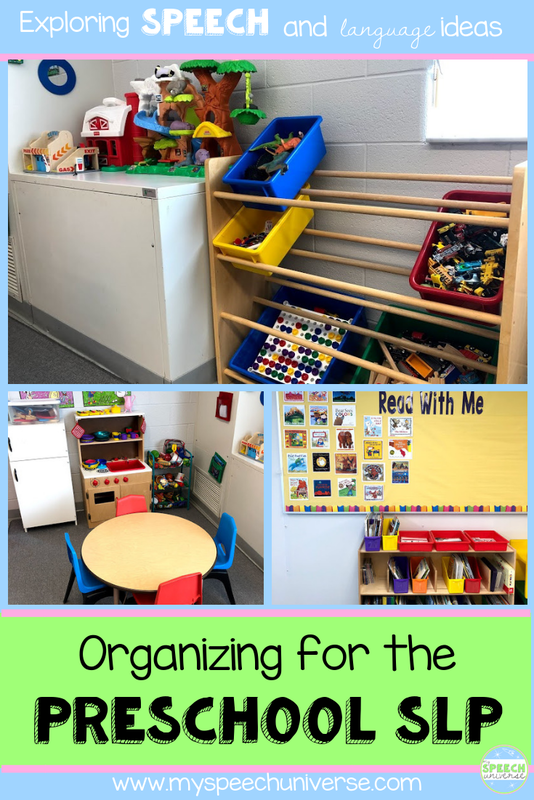 I try to group my students as closely as I can with age and goals, but with parents schedules and preschool schedules to work around, the groups can get a bit mixed. Luckily, I have found a way to structure my room so that I can work on a variety of skills in any group. 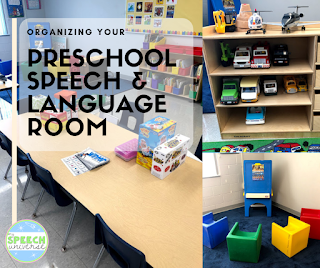 I am super lucky to have a full size classroom as my work space, and I have clearly defined it to move through our sessions. 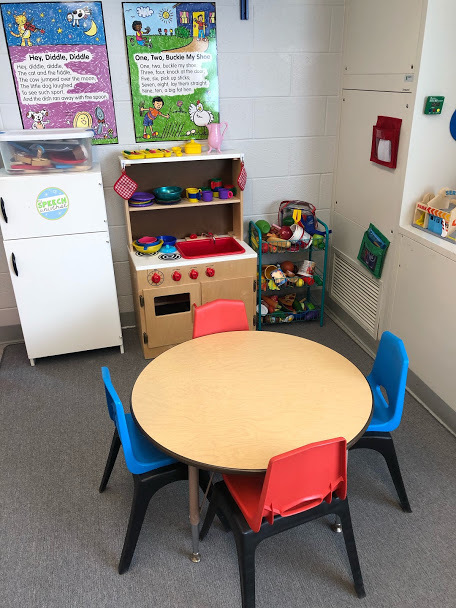 When students arrive, they are able to play in my toy area for about 5-10 minutes (depending on length of their session). I am able to engage with them while we wait for anyone who is running late. It is so fun to see all of the language opportunities during these play times! I've been using a digital timer to warn students that play time is almost finished, ad that has been working great. Once they get used to the warning and then the timer going off, transitions are easy for most. I do have some visual schedules too in case I have a student who isn't so keen on the auditory warnings. After play, we usually go over to the smart board for some movement and songs. 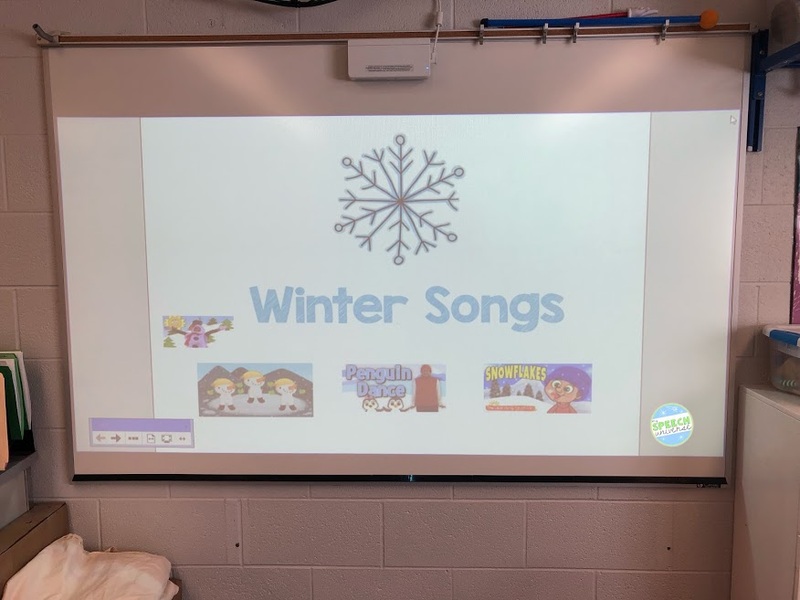 I have a couple of different boards for this, and right now we are using a board that contains different winter songs that I have found. The kids love getting to choose the song from my selections. The songs help get some wiggles out before we move on to more seated activities. Some of my favorites are on the Jack Hartmann Kids Music Channel, Dr. Jean, The Learning Station, and of course, an occasional Pinkfong favorite. After our one or two songs, we move over to the book area. My students love to sit in these mini seats and pick their color. 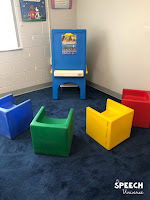 Amazingly, I have very few fights over the color chair. The paraprofessional in my room always copies the front cover of the book of the week so that we can display it a couple of different ways. We put one copy on the easel in the book area, and one copy on the bulletin board in our room. My students love looking at the board and talking about their favorite books that we have read. The board is really filling up! Next, we move over to my work table. 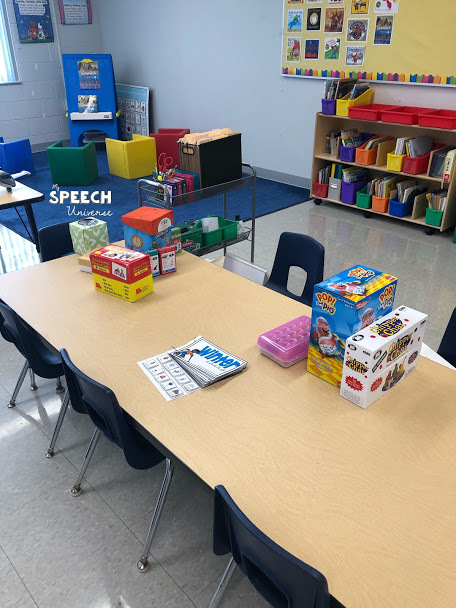 Who am I kidding, the students usually run (preschoolers don't walk) over so they can get their work done and play some more! Plus, they love that we usually have some sort of fun activity or game to go along with their goal work. I usually try to have a game or activity that allows me to focus on a variety of goals. 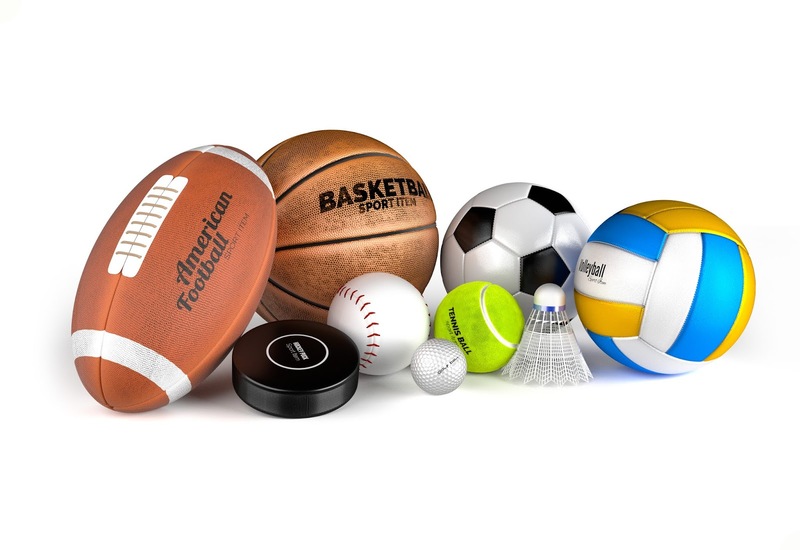 These are usually pretty open ended games/activities such as Pop the Pig, using bingo chips, fishing games, and really any other open ended game/activity that doesn't require specific answers. I love that I can target both articulation/phonological processes and language skills during the same activity. 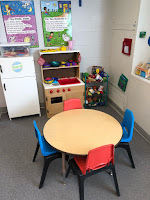 After our work is done, we usually try to play for another 5 minutes, and at this point I may go out and talk to parents while the paraprofessional plays with the students. I may give parents things to practice at home or just update them on what we did for the day. This is how I have organized my longer sessions. 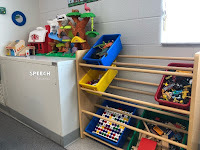 For my shorter half hour sessions, the students are typically younger language students, and we spend more time on play. I also skip the book with some of my half hour articulation students. I have to say that I have been loving how this has been working out, and I have been loving working with preschoolers! They definitely keep me on my toes! 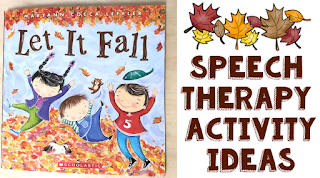 I Found an Excellent Book for Fall PreK Speech Therapy! When you come across a book that engages each and every preschool student that you work with, you just have to share! 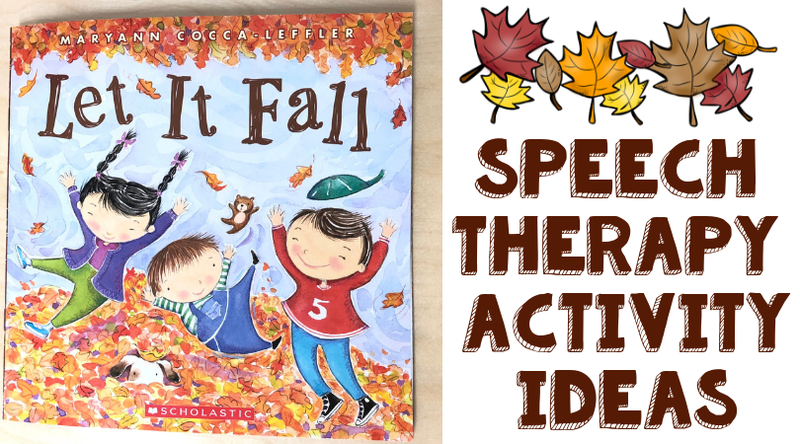 I found this book to use during my Fall theme with my preschool students. 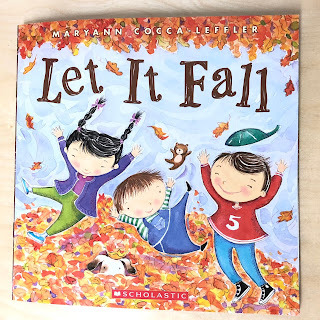 It's called "Let it Fall." 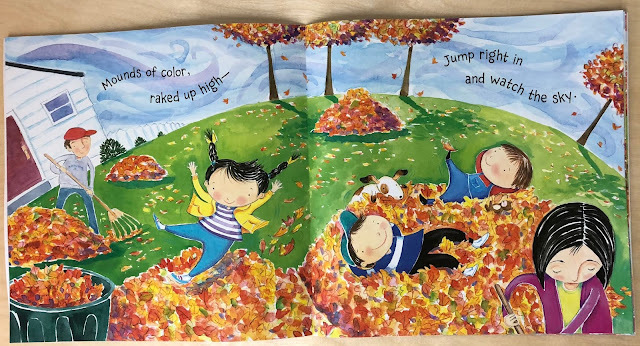 It is a simple rhyming book without many words on each page, but it has beautiful illustrations that are super engaging! I bought it for less than $3 on Scholastic.com! On this page, I was able to help my language students expand their utterance length by stating what each person was doing. The dad and mom are both raking the leaves. The kids are jumping or laying in the leaves, and so is the dog. My articulation/phonological kids had fun naming items on the page. Mom, Dad, boy, girl, baby, dog, leaf, rake. There were words for everyone! This page is great too! 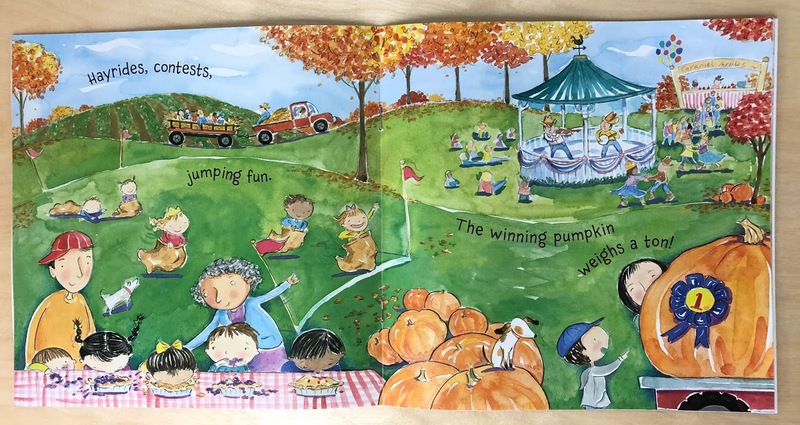 Some kids are having a pie eating contest, some people are going on a hay ride, there are two men playing music, people are dancing, people are listening, there is a sack race, there is a pumpkin contest with a big pumpkin, the dog is sitting on the pumpkins. Oh, my! So many things to describe!!! 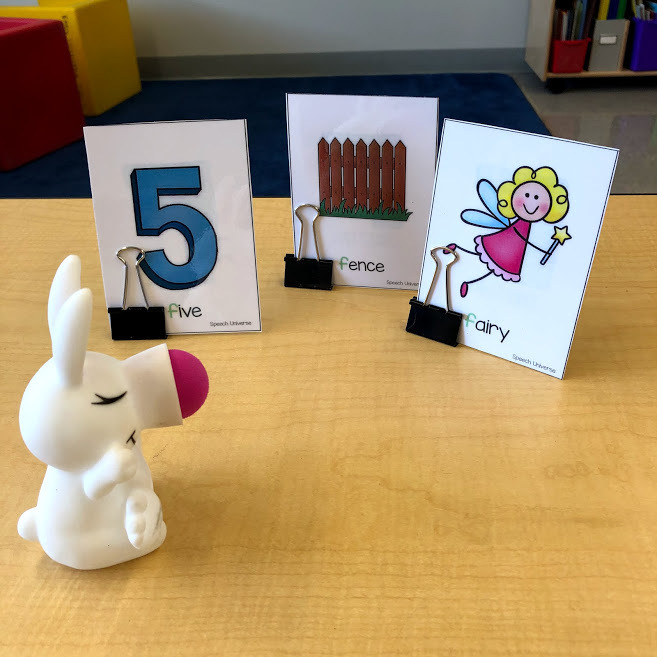 Some of the words I used for my articulation/phonological students were: ton, pie, eat, sack, jump, hop, ride, (I have a lot of final consonant deleters) and really anything else we could find that fit their goals. The rest of the book is just as great as the pages above, and led to a huge variety of discussions based on needs in my groups. 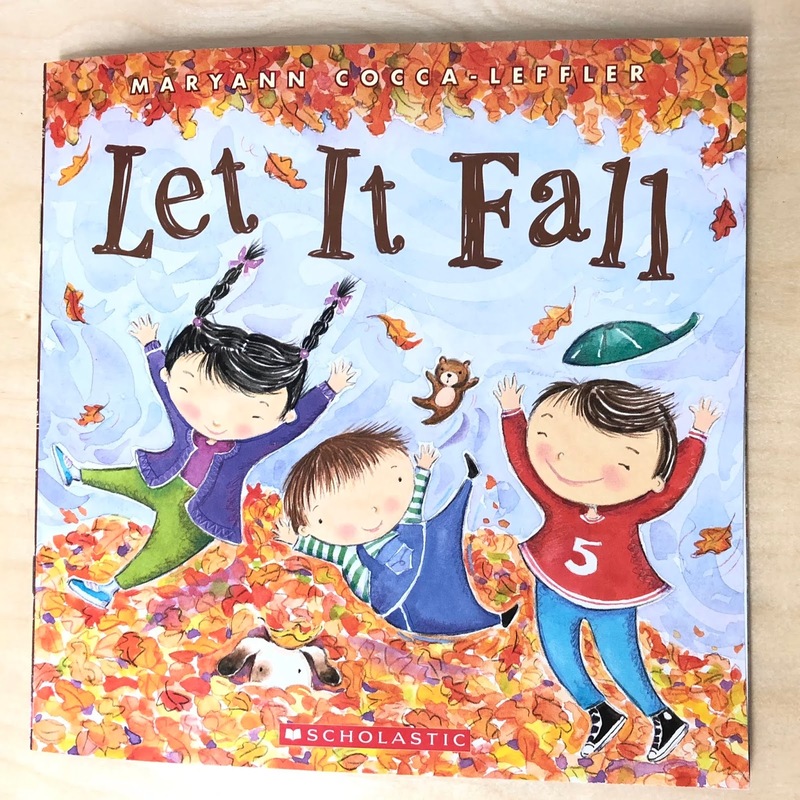 I just wanted to share this cute book with you in case you were looking for something fun to share with your preschool friends too. 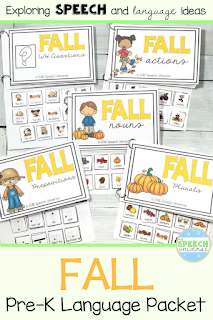 If you are looking for some activities that will use a lot of the words that are in this book, you could check out my Preschool Language Theme Packet for Fall. 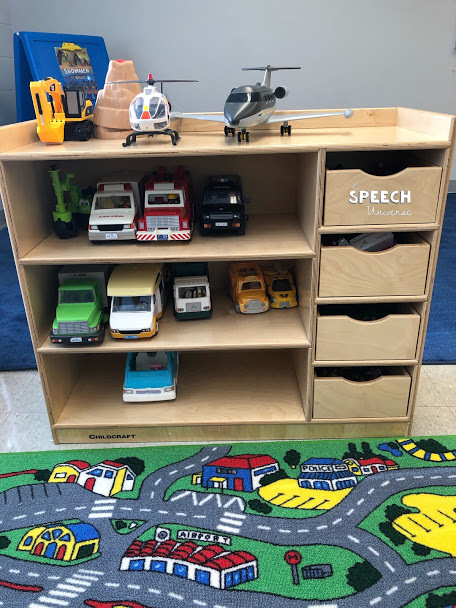 It is chock-full of activities to do with your Pre-K language students. I bought a large bag of 200 trinkets from Dinky Doodads on Etsy last year, but never really organized them like I wanted to. I just couldn't make the decision of what to do with them. Well, the inspiration came to me last week. 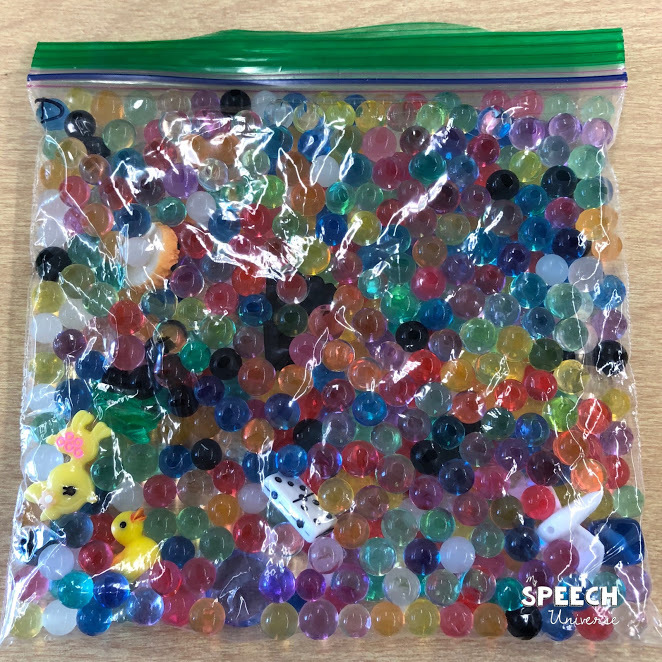 I was talking to an Early Childhood Special Education teacher at my school and she showed me a bag that she had filled with water beads and rubber fish that she was using for an aquatic animals unit. It was so fun to squish around to find all of the fish. This made me think of all of those little trinkets that I had sitting around, waiting for the perfect activity. I just had to organize them into their sounds. I had a bottle of water beads from my days of making some sensory bins. Today I made a huge batch of these little pearls of fun! I can't wait to use these bags! 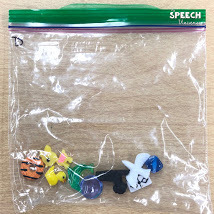 I'm also thinking about buying another set and making categorization and phonological bags. 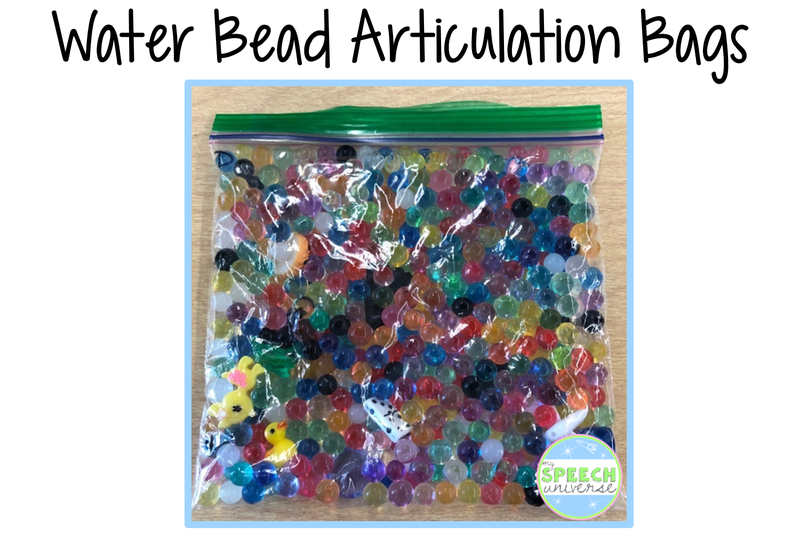 When and if the beads dry out (not sure how long they will last) I plan on adding water to the bag to re-hydrate the water beads. I'll keep you updated when that happens. I have a rare blood type that only 3% of the population has. I'm AB+. The Red Cross calls me often to donate my "rare blood." I put it on my to do list and schedule a time. Sometimes I can end up making it to the appointment and actually donating. I've had other times where I show up and there has been over an hour wait even with an appointment. I've had to leave and not donate because my life is in a crazy balancing act right now and I had to leave to get to the next items on my list. Then I feel guilty. My typical to do list in the afternoon includes hockey, soccer, or baseball practice, hockey, soccer, or baseball games, school activities for my boys, orthodontist or doctor appointments for my boys, homework, making dinner that has some sort of nutritional value, and then maybe picking up a bit before going to bed and starting all over. Sometimes the dinner might not be that nutritional or my little people are late to an appointment, practice, or game. Then I feel guilty. My work life is also a huge balancing act. I've got two schools this year and both schools have heavy schedules of students. At my private school I am in charge of setting up all of the service plan/IEP meetings, evaluation meetings, and other special education meetings. This is for students with some pretty complex needs. Setting up meetings has never been my strong suit, and this year has been a huge challenge for me. 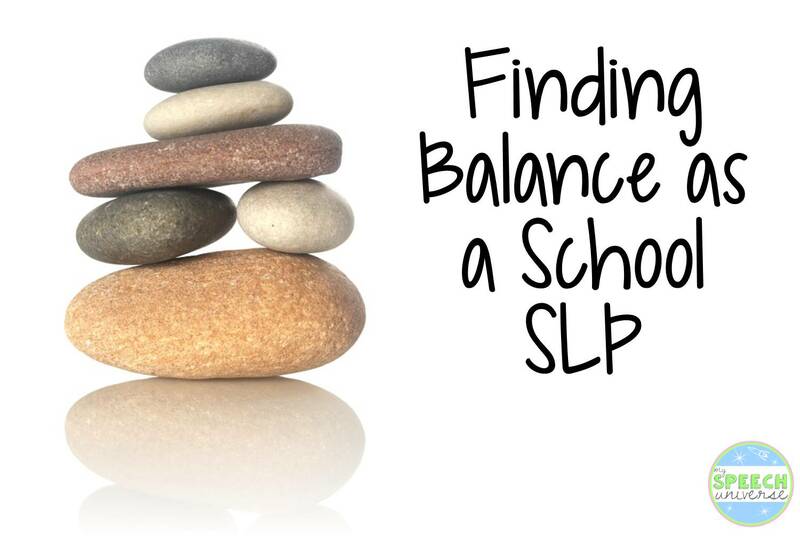 Coordinating the school psychologist, teacher consultant, resource room teacher, general education teacher, principal, and all ancillary staff is highly overwhelming at times. Sometimes someone is missed in the meeting scheduling, or an email is missed, I'm late for a meeting because of traveling, or I am missing students. Then I feel guilty. 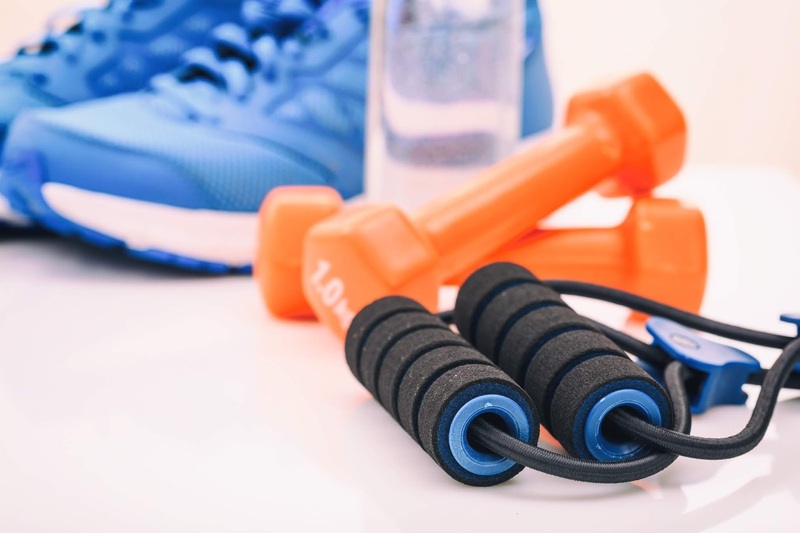 Because of all of the stress with my work and home schedules, I decided that I needed to focus on my own health a bit more. So, on top of everything else, I have started waking up at the early awful ungodly hour of 4:40 in the morning so that I can make it to a 5:15 boot camp at least three days a week. When else am I going to go work out? There are mornings when my alarm goes off and I press snooze. 5 times. I miss my class. Then I feel guilty. People talk about type A personalities and how they are ultra organized and motivated. I admire these people. I want to be these people. But, I feel like I'm more like my blood type: AB+. People compliment me on being organized but I know it is just a facade. My planner is super organized but a lot of times I don't feel like my brain matches that organization. I am just one missed glance at my schedule or planner away from everything toppling over. Why am I telling you all of this? 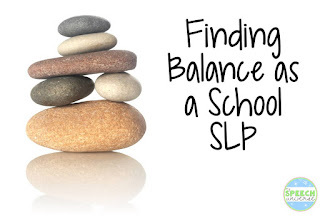 I'm telling you this because I want you to know that we all have a hard time balancing it all! Our Instagram or Facebook accounts may look like we have it all together. 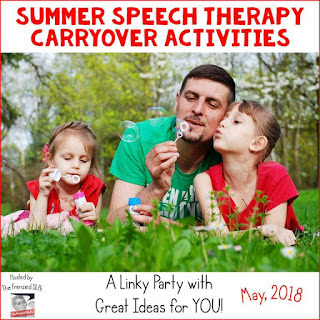 Perfect activities planned for each session. 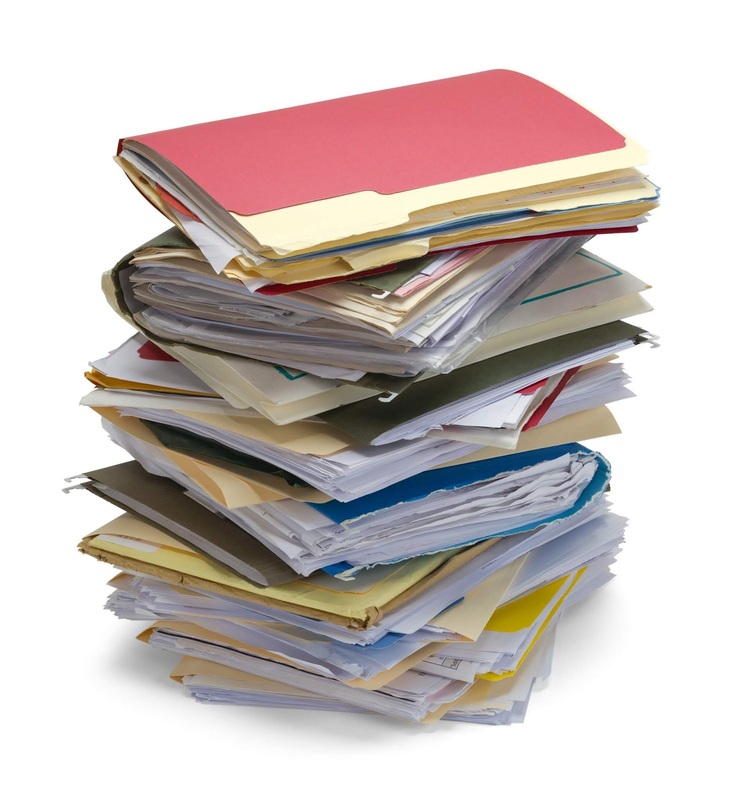 Perfectly organized materials and files. Materials personally made for each student. A lot of times it's a facade. I may post a picture that looks perfect, but know that behind the scenes there was a lot that was not perfect that day. I may have had the perfect activity that was made for a specific student, but the rest of my caseload played the memory game. Again. I love my life that I have created. I love my family, my friends, my students, my job, even my 5:15 boot camp class! But I know that there has to be a balance. Finding that balance is tough, but I will keep trying. I also know that it is ok if some things fall out of balance. 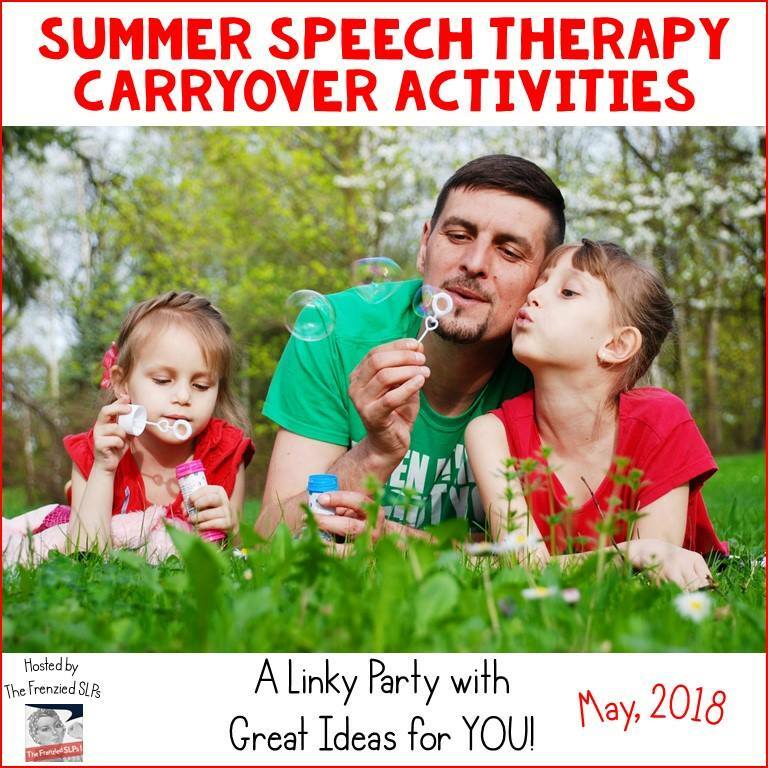 I am joining up with the other Frenzied SLPs to bring you summer speech therapy carryover activities. 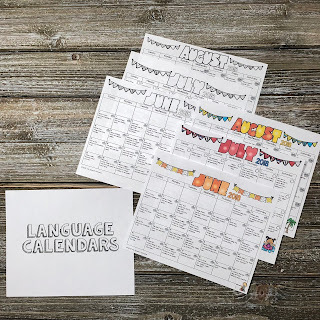 Today, I am sharing my updated 2018 Summer Speech and Language Calendars with you! 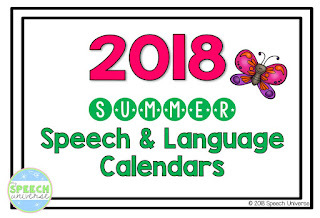 Every year I update my Summer Speech and Language Calendars. 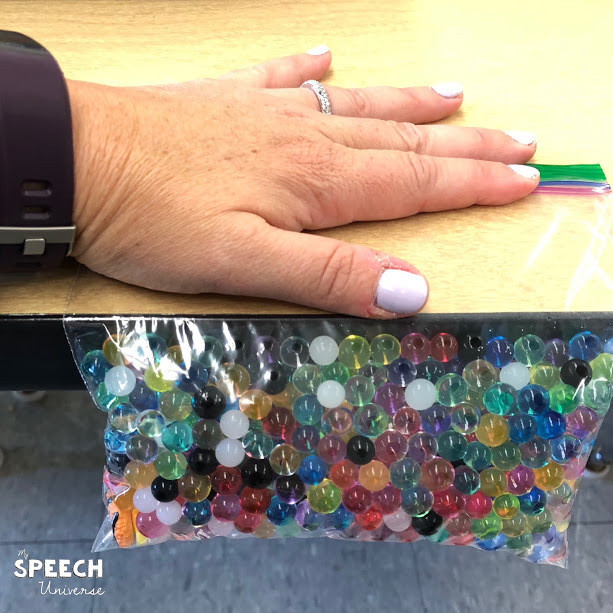 These are so easy to prep and send home with students for the summer for a little extra practice. Parents appreciate the ease of use. Simply put it on the refrigerator and practice an activity every day. Each activity takes less that 5 minutes, but allows for the student to think about their sound every day. These calendars come in black and white and color versions. 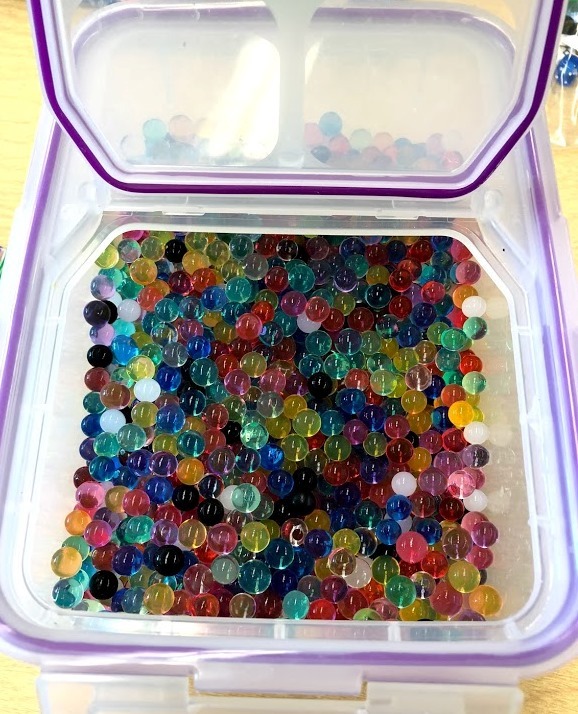 There is an activity on each day, and a small icon for students to color in after they have completed an activity. As with the articulation calendars, there is a different activity for each day. Students color in an icon after they have finished the activity. 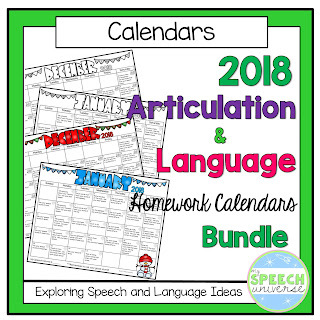 Language skills included in this packet: categorization, describing, story telling, analogies, idioms, synonyms, antonyms, plural nouns, past tense verbs, auditory comprehension for sentences, auditory memory, calendar vocabulary (yesterday, today, tomorrow, etc.). There is also a letter to parents and a communication log for each area (articulation & language). 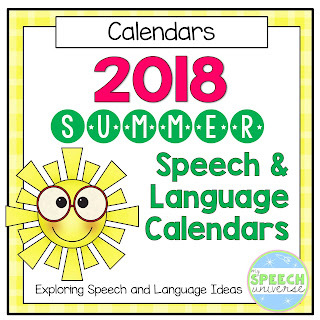 You can get these Summer Speech and Language Calendars HERE. 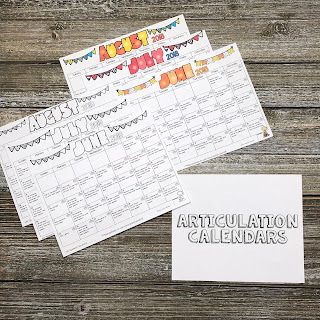 They are also a part of a bundle of articulation and language calendars for the entire year that you can get HERE. 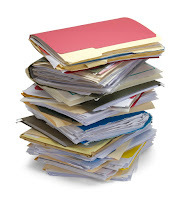 Is your caseload bursting with articulation students like mine is? It has been years since I have had this many articulation students, and frankly, I was getting a little sick of my activities that I had! 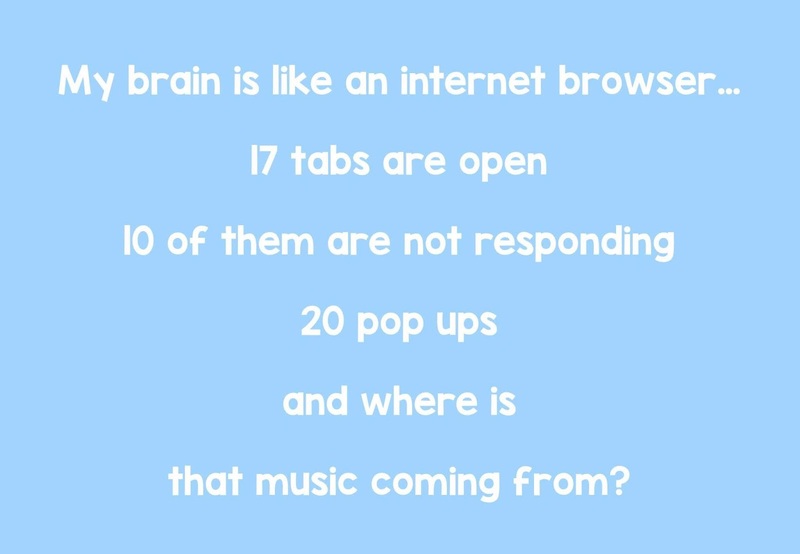 You can only play memory or Go Fish so many times, you know? What my students don't get sick of is bingo dabbers and markers. I swear, I can pull out a pack of markers or dabbers and I am a superhero! 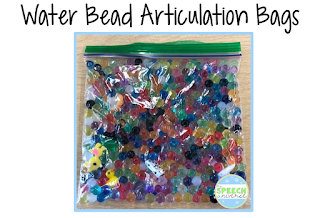 Because of this, I decided to make a set of articulation pages for my students to color or dab. 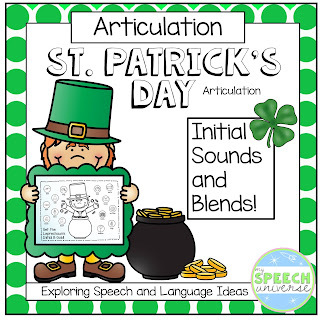 St. Patrick's Day Articulation was born! 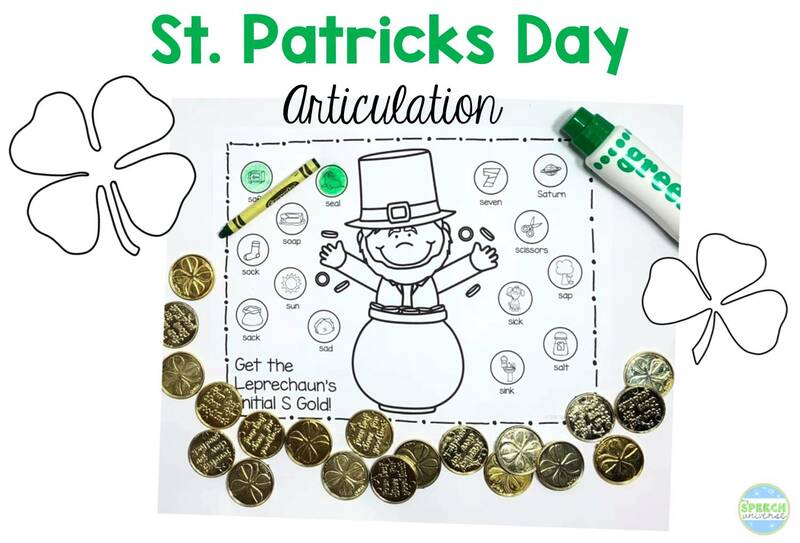 Students can use their marker or dabber to color in the Leprechaun's gold after they say their word a number of times. If you have your student say each word 5 times, you will get 70 productions from this one page. Imagine if you have them say it 10 times! 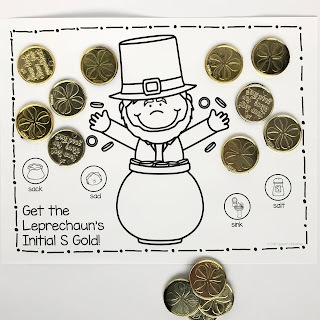 If you have some gold coins, you can also have students earn their gold by saying the words and then covering them up with the real coins. I included a blank sheet so that you can also fill in your own words if you would like.